Use the configurator to select the right rims for your car. Advanced search: If you are sure what parameters should have wheels, use the search method below. Find product Find a product by entering the appropriate model of aluminum wheels. Enter parameters to select the right tyres. Use the search to find the right tire for your car. Parameters such as width, profile and diameter are read from the tire you own. If you are not sure - call our qualified staff to help you make your choice. In our offer you will find original tires from reputable manufacturers that have all the required certificates and approvals. We guarantee shopping security and professional advice. Use the search engine to find the right steel rims for your car. Parameters such as spacing and size are written down on the rim you have on your car. If you are not sure what to choose - call us and we will help you in choosing the right steel rims. Buying at ladnefelgi.pl you can be sure of successful and secure transactions. If you seek smart and dynamic look for your car, alloy wheels are the obvious choice. Tailored to fit your car, they make it look smart and stylish. 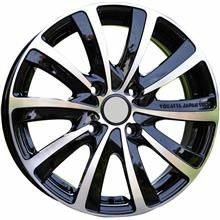 We provide alloy wheels compatible with all leading car makes: from Audi, through Ford and Fiat to Volvo and VW. There are 900 different wheel models to choose from our offer. Each of them varies in design, style and size. This diversity makes our store unique. Whether you need 15˝, 16˝ or 22˝ wheels, you will find the ones that suit your needs. We offer more than great number of products to choose from. With us you get the best purchase terms. We can offer the lowest prices because we cooperate directly with wheel manufacturers. Are you looking for steel wheels and have a problem with choosing the right company? 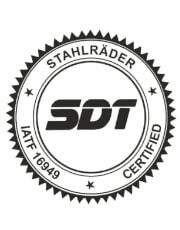 Check the range of StahlRäder steel wheels - high quality, certified product, 24 months warranty. Shipping for PLN 0!